Pour 2 cups water into Presto® pressure cooker. Position the cooking rack or steamer basket in cooker. Rub garlic powder into all surfaces of corned beef. 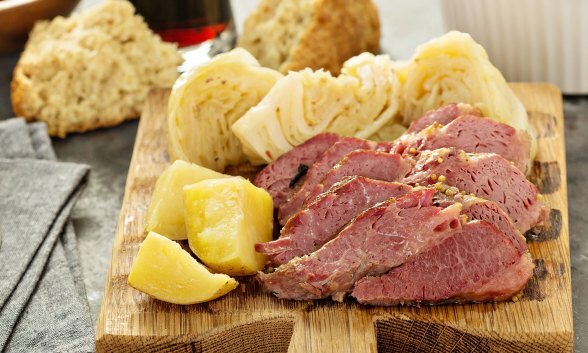 Place corned beef on cooking rack or in steamer basket. Add bay leaf. Close cover securely. Place pressure regulator on vent pipe and cook 60 minutes at 15 pounds pressure, with pressure regulator rocking slowly. Let pressure drop of its own accord. Cook above recipe for 55 minutes at 15 pounds pressure, with pressure regulator rocking slowly. Cool pressure cooker at once. Add the following ingredients to corn beef: 5 small potatoes, 3 carrots, cut into 1-inch pieces, and 1 lb. cabbage, cut into wedges (do not fill pressure cooker over 2/3 full). Close cover securely. Place pressure regulator on vent pipe. Cook 5 minutes. Cool pressure cooker at once. Sift together flour, sugar, baking soda, salt, and baking powder into large bowl. Cut in margarine until crumbly. Stir in raisins. Add buttermilk and stir to make a soft dough. Turn onto a lightly floured board and knead to form a soft ball. Pat by hand on a greased baking sheet to 1 1/4-inch thickness. With a sharp knife, score into 4 sections. Bake in 350 degree oven 1 hour, or until bread is browned and a toothpick inserted in the center comes out clean. Serve warm with margarine. If seasoning packet is provided with corned beef, use packet and omit bay leaf.